As promised, scrappy quilt number two is finished and ready to share! I was determined to use as much unloved fabric as I could and made a good dent in the stash with my first scrappy quilt 'Magic Circles', that I couldn't help myself and designed one more quilt! EQ8 to the rescue! 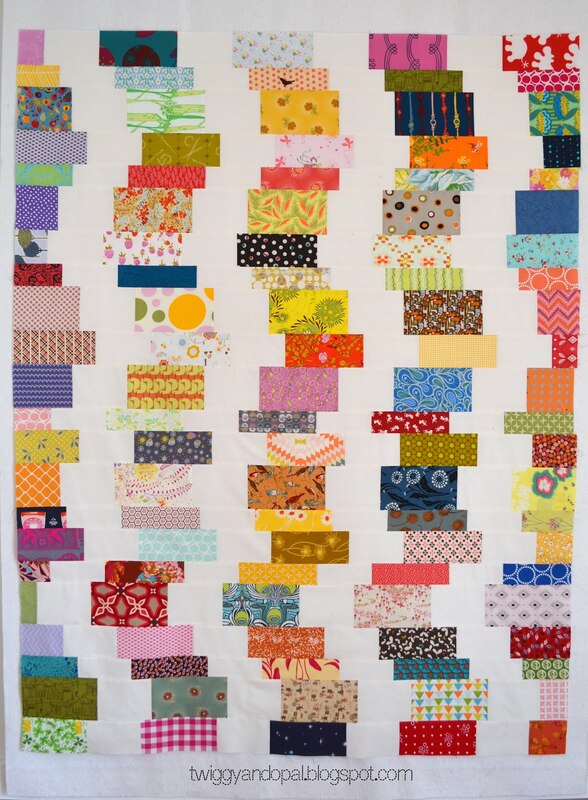 Stacked quilts are a good way to make a dent in the old stash, make it fun and its simply simple! There are a good number of patterns available for stacked quilts and all are very good, but I decided to make it harder for myself and design my own. Why not, right?! I ended up with 'Stacked Wiggles'. Stacked to the hilt with 110 different prints! I'd call that crazy! I used Kona Snow as a way of taming the madness, which I learned from the Magic Circles makes all the difference! I was able to use tons of fabric from the smallest of scraps to largest on hand. It all began with the design. 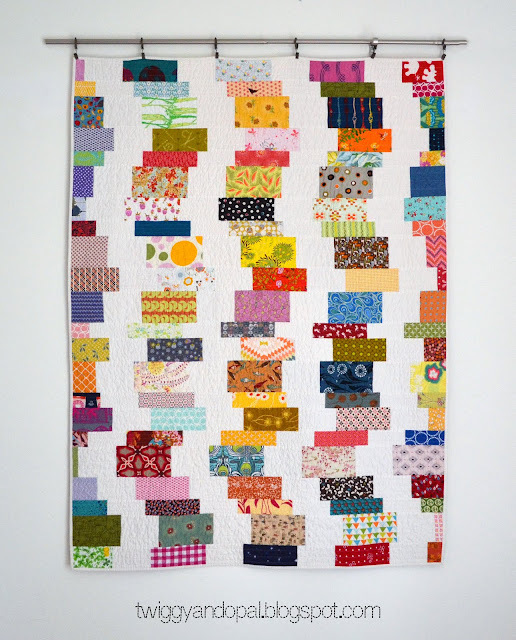 Many stacked quilts use repeat rows stacked together to create the flow of the stacks, or have you trim the sides. I on the other hand didn't do that, perhaps I should have to make it easier, but I didn't. Instead each of the left and right side pieces are different sizes. I was able to use scraps that were all sorts of sizes for those filler pieces. I'm sure I have totally confused you now! Here's a close up of my chicken scratch and maybe that will convey better what I'm trying to explain. I started by cutting all my rectangles. The prints are 2 1/2", 3 1/2" and 4 1/2" x 7 1/2", and the Kona Snow sections are 2 1/2", 3 1/2" and 4 1/2" x 5 1/2". It took a while only because I had to decide which scraps were going to be cut to which size and I was trying not to use duplicate prints. Once I had that sorted out I was able to stack pieces and cut 3 or 4 rectangles at a time. The side pieces were cut from the smaller scraps when the pattern called for it. The rows went together so fast, which I loved! I should state that for the side pieces, you could very easily use any length and then trim after the rows are sewn together. That might make it even quicker, but I'm a glutton for punishment and did not do that! Before long Viola! a flimsy is born! And I couldn't have been more pleased with the results of this one too! My mission of using my stash is in full swing and I can just about give it a rest for a while. The magic of white, right?! I love scrappy quilts, but I also need a place to rest my eyes! I choose to keep the quilting quite simple. I went with horizontal straight lines from top to bottom. The 2" rows have 1/2" lines, 3" rows have 3/4" lines and the 4" rows are 1" lines. Simple and done! Oh, let's not forget about the back! Scraptastic! Another thing I learned from Magic Circles, is the back was so crazy, this time I added white and like it much better. I also kept the 'wiggle' action from the front. I'm learning! I've been making a quilt diagram with the left and right side piece measurements for future reference. That way when I make it again I won't have to think any harder than necessary! I said that my scrap busting is temporarily halted, but that isn't entirely true! 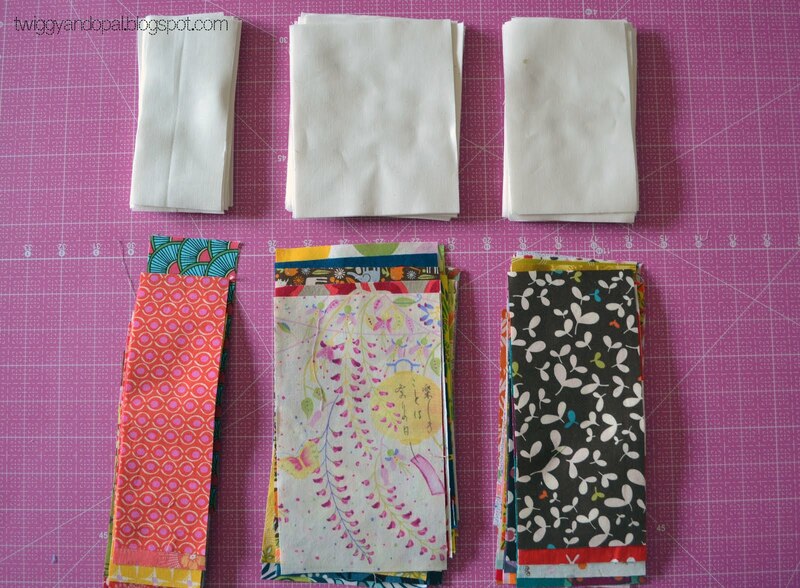 I cut more rectangles for a future scrappy Baby Stacked Wiggle quilt! By future, I mean when the mood strikes me...I'll have everything ready to go! I had the scraps out and took advantage of the situation. I killed two birds with one stone...as barbaric as that is! 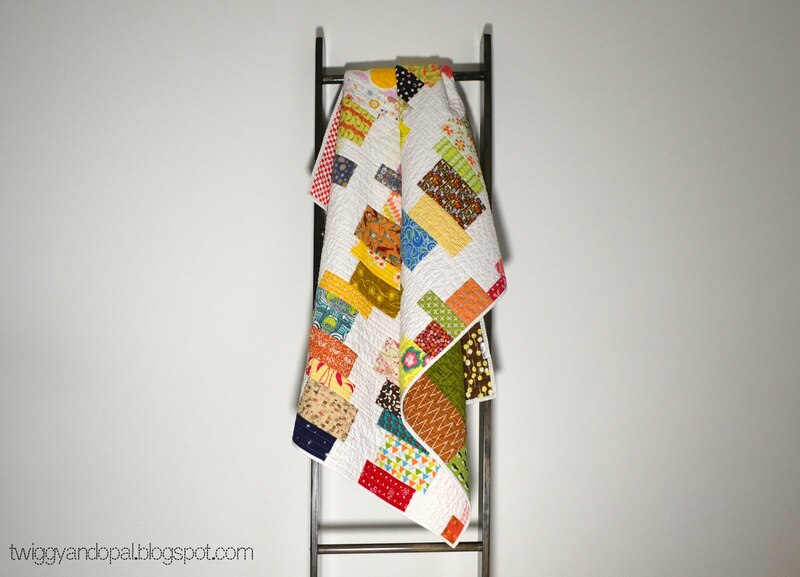 Stacked quilts can be as easy or as hard as you want. I think I made it a bit harder than it needed to be by making and cutting all the side pieces in varying sizes! Live and learn! Do you tend to take the easy route, or do you think it through first and make it easier? I usually think of easier options after the quilt is finished! Thank you! I would have too, but I didn't know there was an easier route until I finished! Jayne, a scrappy quilter? Who'da thunk it! Certainly not me Libby! I’m determined to work through my stash of unloved fabrics this year and so far…I’ve made a lot pf progress! it's awesome! I'm with you, I often finish a quilt & then say "hmm, that could have been easier if only I'd....."
It did the job of using my stash! I don’t know how to plan things out ahead of time! If I knew there was an easier way at the time, I sure as heck would have done it! Maybe next time! I love it! Hard or easy way, it is a great quilt! And the back is fantastic, too! Very creative! that is cute - love the "wiggle"
Jayne+prints+scrappy=I'm totally digging it! Honestly, I would have probably tacked the side pieces like you did. I hate trying to square things up at the end. It's like trimming your own hair...is that side straight? Do I need to whack off more? I love it!! what a fun way to use the scraps! Fun and done! Love it. I tend to take the hard route at times. I think I do it to myself just to see if I can. Haha. 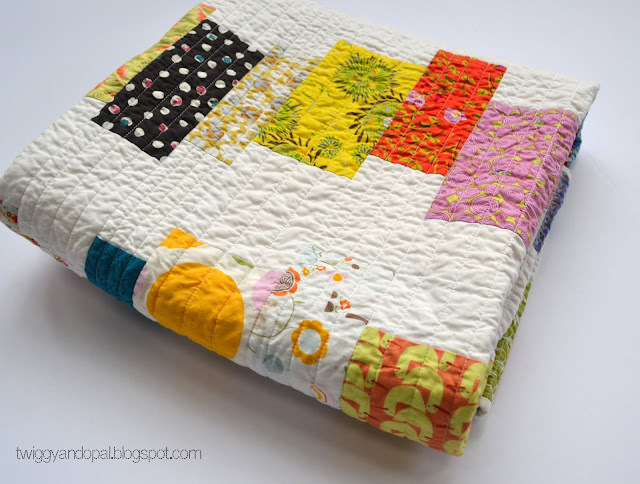 That's is one happy scrappy quilt! I love using up scraps! What a great scrappy quilt. Using Kona Snow was a fabulous idea. Just perfect. Well done, Jayne! Such a lovely use of scraps! I really like how each row is a different width. And the solid fabric really gives the eyes a place to rest. I hadn't thought of stacked quilts as a category. Thanks for that! Would you say it is the same category as coin quilts or different? Chock that up to weird questions only a quilter would ask. I love weird questions! 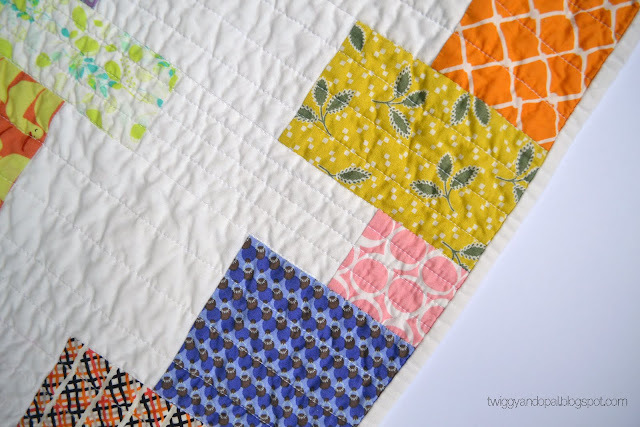 I never thought about this quilt as a coin quilt, but now that you mention it…it could be considered that too! When I think of a coin quilt I think of skinny strips all one size. I don’t know that that’s true or not! It’s funny how somethings never cross our minds while designing and making quilts until it’s all said and done! I love your scrappy quilt! I tend to pick easy so ya for you making the extra effort! Looks great. I like how it looks with various heights. Nice job. 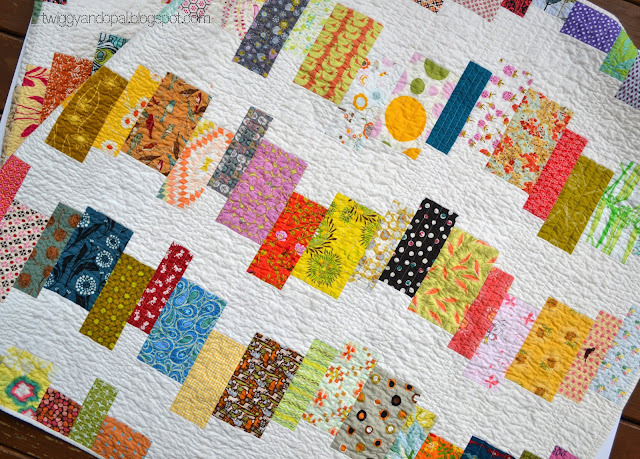 Very cute scrappy quilt, I love the squiggles. Love, love love this quilt. But is it weird that I also love your little printed pattern? There really needs to be a mini version in your future, yes? How fun is this? Some stacks look like they're ready to fall over, but then come back to center - makes for a fun optical illusion. Awesome work! I love that you repeated the design on the back in a larger scale; I've done that a couple of times too. Well done! I love this scrappy stack, Jayne! The white really does give the eye a chance to rest, but it also allows all the beautiful colours to shine :) I probably would have tackled the sides the same way you did, too. I totally agree that you need a place to rest your eyes in a scrappy quilt and you did a great job using the Kona snow to do that. It may have been more work to make the rectangles different sizes but it made the quilt a bit wonky and more fun! Really great quilt! The white sets it all off perfectly so the scraps can shine. Great idea! I remember when you told me you weren't a scrap quilter and would never have any posts to link up to Oh Scrap! Hee Hee. 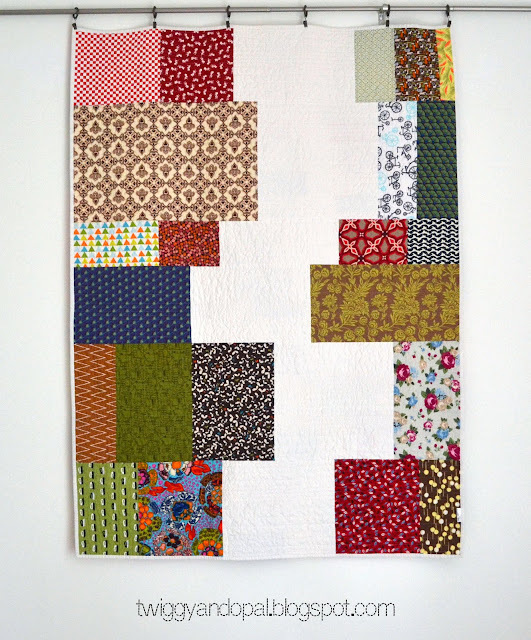 It is great seeing you and your lovely scrap quilts here often! Cute! Fun way to use scraps and they all play nicely together. I love scrappy backs but I don't really like making them. Good luck on your mission to use your stash! I'm on the same mission. 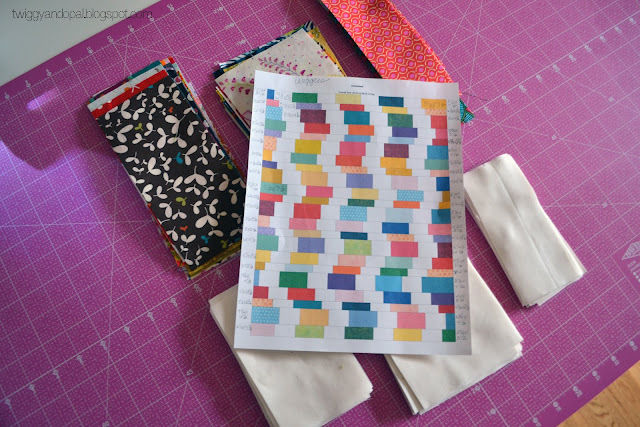 This is a great way to use up scraps and I love that the design means you aren't working to match seams. Well done! Love your Stacked Wiggles! How much white yardage did you use? Thanks for inspiring. Lilly Pilly :: You're Done!